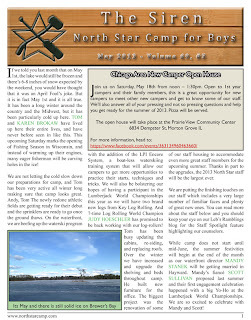 Spring came to the Northwoods… and then it disappeared, all in time for Andy’s trip to camp. Over the course of his few days there he had 80 degree days with sun, followed by a snow fall that dumped upwards of eight inches. Check out the May 2013 Siren to check out some great pics of Andy’s trip to camp (or check out our “winter in spring” album on Facebook). You can also read about lots of new and returning staff that will be joining us this summer, including our great group of Counselors in Training and Wilderness Trip Leaders. Despite the cooler temps, we’ll have staff arriving at camp starting at the end of May. If you have any questions as you prepare for the summer, do not hesitate to contact us and let us know how we can help! This entry was posted in 2013, Siren on May 3, 2013 by Dan Lichtenstein.